Outsourcing has witnessed a massive boom over the past few decades, with the number of service providing companies increasing every year. The year 2018 is going to be no different when it comes to keeping up with this exponential growth in the outsourcing trend. 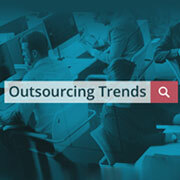 IT outsourcing trends, this year, have seen a constant growth and this trend will continue to grow in the coming years. While there has been a constant growth in this sector, there have also been several new trends, which have emerged and stayed for the betterment of outsourcing. However, companies providing the services need to stay constantly updated with all the latest outsourcing trends along with some of the most probable future trends in outsourcing to provide their clients with highly efficient and top-quality services. In this article, we have listed some of the major outsourcing future trends that are expected to govern 2018 and beyond. Data security will continue to top the priority list when it comes to outsourcing. With Internet of Things (IoT) and telematics becoming highly prevalent, security risks are poised to increase. Therefore, threat intelligence, advanced security automation, security analytics, etc. will continue to dominate, as companies choose to stay safe and protect their businesses from external threats. Robotic process automation and intelligent automation will continue to flourish in the coming years. This is expected to disrupt the existing commercial outsourcing model and drive down costs considerably, resulting in supplier margin expansion. Furthermore, enterprise buyers will also have opportunities to save more, as the supplier margins expand. With the use of self-service tools and automated chat-bots becoming highly prevalent among many companies, the demand for call centers is expected to decrease drastically. As virtual agents can work on numerous clients at the same time, these automated contact centers will be able to handle higher volumes with less number of agents. Therefore, we will see various tech-enabled contact centers replacing the traditional call centers, few years down the line. In the time to come, businesses will see robotic automation tools become more intelligent. Today, there are several organizations who are working on adding new cognitive features to robotic tools. Certain amounts of context awareness will be embedded into the robots of the future, which include natural language processing and computer vision. Last year, the market witnessed a considerable amount of mergers and acquisitions in IT and business process outsourcing sectors. This trend is expected to continue and increase in 2018. Therefore, until smaller players make timely mergers with the right partners, the chances of only the stronger players surviving in the market are higher. Over the past few years, service providers have come up with a wide-range of cognitive platforms. However, in most of the cases, providers have overstated their unproven capabilities, resulting in market hype and confusion. This year, providers are expected to clarify their messages by focusing on specific success stories. With an increasing demand for the usage of cloud platforms in outsourcing, the cloud-savvy clients are expected to demand more from the cloud providers. Therefore, enterprises are expected to demand significantly higher value from the cloud providers for driving transformation in their businesses. Companies are expected to look out for service providers who add value to their business rather than those who just provide services at lower costs. Therefore, outsourcing companies will partner with service providers who offer innovative services, equipped with best infrastructure and thorough industry knowledge. Machine learning, as we all know, provides a series of benefits including cost savings, faster completion of the processes, and even improved quality of the services provided. Furthermore, all the outsourcing solutions cannot be handled by automation, and this is where machine learning helps. Machine learning helps service providers to offer efficient services within extremely short turnaround times. Telecommuting is one trend which has changed the way outsourcing companies operate over the years and this trend is here to stay. Companies find it very easy to interact with other team members and integrate seamlessly through remote meetings and use different types of real-time monitoring tools to deliver quality services. 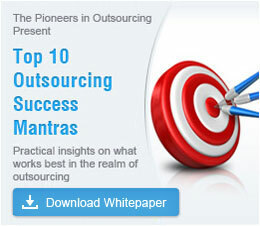 Outsourcing trends are constantly changing and this change is expected to continue in the coming years as well. With new technological developments progressing regularly, the outsourcing industry is only going to get bigger and more efficient in the years to come. Companies will mainly focus on providing top-quality services and great customer experience, rather than merely focusing on reducing the cost of the services they offer. Previously, outsourcing companies focused mainly on outsourcing non-core functions to service providers and carry out the core functions by themselves. However, this trend is expected to change as more and more companies will now outsource their core functions to highly efficient and reliable service providers. Today, outsourcing companies look for services that add value to their business, rather than the ones that merely help them cut down on their expenses. Read an article to discover the preferred outsourcing destination - India or Davao City - Emerging Outsourcing Destination. Outsource2india is a leading outsourcing service provider based in India and has been serving global clients for over 20 years now. Staying constantly updated with the latest industry trends and carrying a vast, multi-domain industry experience, we stay ahead of our competitors. We have the required infrastructure and skilled resources to provide a wide range of services, such as call center services, data entry services, software development services, creative design, photo editing services, research and analysis, healthcare BPO services, etc. Therefore, if you are looking for a reliable, efficient, and cost-effective offshoring service provider, then look no further. Get in touch with us today!